Basic game navigation is simple. "Versus" is right on the main menu and "Single-Card Play" is on the Versus menu. Download time is around average. The biggest problem, especially for less experienced players, is the instruction manual thaty came with the game. The manual implies several features, by mentioning "the ability to customize various race options before the start of the match including the number of AI opponents and number of laps" that are only available in multi-card play, even though they're mentioned in the "Single-Card Play" paragraph. The manual also makes it appear that Challenge Cards are available in Single-Card Play, even though they aren't. To confuse matters further, the manual neglects to mention the one feature that can be changed: the selection from a pair of tracks. Basic menu navigation is easy and simple. All of the menu areas accept input exactly as expected with sufficient buffer space between tappable areas. Like other driving games, Ferrari Challenge: Trofeo Pirelli is easy to pick up and hard to master (win). Basic driving is simple and intuitive, using what are arguably the most intuitive button controls available for a racing game (they've been used for several other games before this one). As is expected, the game, a more realistic racing title than Mario Kart DS or Diddy Kong Racing DS, uses more realistic physics. This results in a high level of skill being needed (especially in cornering) when coming back from behind in the race. Being targeted at fans of realistic racing means that players seeking a skill-based challenge will be much more satisfied than players seeking a weapons-filled, light-hearted racing game. Graphically, the game is excellent. The graphics are not free of pixelation when getting too close to a wall, but the overall look of the game is above average. The Single-Card Download portion of the title features primarily sound effects and background audibles, which sound fine. All of the features implied by the instruction manual (see above) are not available in the Single-Card Download multiplayer, but the host can choose from two different tracks. Unfortunately, some of the other settings (left-handed control, an alternate camera angle, manual transmission, etc.) are only available to the host. Ferrari Challenge: Trofeo Pirelli is the eighth car racing title I've reviewed and it's the fourth that is designed around actual cards and actual physics. Instruction manual aside, there's nothing wrong with the game. It does exactly what it set out to do: it's a racing game with realistic physics, easy to learn controls, and hard-to-win races. On the other hand, it doesn't do anything to stand out from the pack, either. Yes, it features cars from Ferrari and while that appeals to fans of real-life cars, many video game racing fans are more interested in what makes a game uniques, what makes it special, and what makes it stand out in terms of gameplay. Like I said, there's nothing wrong with the game. Everything works. Ferrari vehicles aside, it's just very vanilla in its Single-Card Download experience. But hey, who am I? Some people love vanilla. From my score for the game (79/100), you can tell the game is a fine racing title. Try it out for yourself and see what you think. Fix (or remove) the instruction manual inside the game's case (see above). Make left-handed controls available for the guest(s). Offer manual transmission and the alternate camera angle to the guests (pre-download if necessary). Allow the selection of the number of computer-controlled cars. 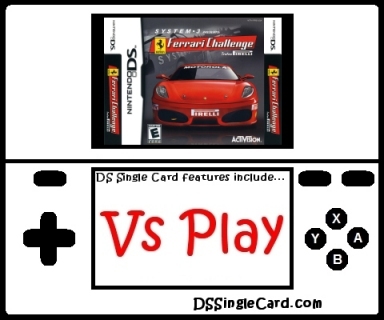 Let the players (host and guest/s) select from at least two or three cars in Single-Card Download play. Click here to return to the DSSingleCard.com Ferrari Challenge: Trofeo Pirelli profile.